Attrition is an electronic music band, formed in Coventry, England in 1980 by Martin Bowes and Julia Niblock. 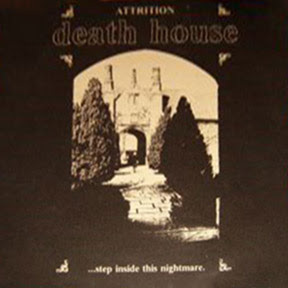 Influenced by punk's do-it-yourself aesthetic, Attrition appeared on compilation cassettes featuring contemporaries such as Portion Control, Konstruktivits, Chris and Cosey, Legendary Pink Dots, Nurse With Wound, Metamorphosis et al. However, while associated with the industrial scene, the band found it difficult to attract an appreciative audience. Their early post-punk stylings soon gave way to a distinctive electro-acoustic sound. This was based on Martin's deep growl, Julia's fretless bass work and breathy sub-operatic vocals, and a backline of electronic instrumentation, comprising analogue synthesizers (including a Korg MonoPoly and Korg MS20), sequencer (Roland MC202), drum machine (Roland TR808), and various effects units. "At first, there wasn't the same sort of scene and we were in more of an 'industrial' thing. There was nothing like the clubs you get now, it was actually quite difficult to play anywhere that would appreciate you. It's a lot easier now, it's not just Goth, it's a mix - Darkwave or whatever. That's gotten stronger, so that has helped, but really, we were there before it was built. "In 1979, Martin started a zeroxed fanzine called "Alternative Sounds", to document the Coventry music scene (including such notables as The Specials and Furious Apples). The fanzine ran for 18 issues until 1981, and culminated in a vinyl compilation, "Sent from Coventry" (on Cherry Red records) and a brief appearance on the BBC's Something Else programme. During this time, Martin met Julia at a local gig and Attrition was formed; the initial line-up included Martin's brother Chris on guitar, who left in 1981 to join the army, and Julia's brother Ashley Niblock (who would become another mainstay) on synthesizer. Two early home recordings, "Fear" and "Devoid", were issued in 1982 as a flex-disc given away with the "Adventures in Reality" fanzine run by Alan Rider (later of Stress and Dance Naked), who would provide the band's visuals for live shows. Two experimental electronic soundtracks ("Crawling" and "Dead of Night") were released as the "Death House" cassette (later reissued on vinyl by Hamster Records as "This Death House"). Also in 1982, Gary Levermore included an Attrition track ("The Visitor") on the first volume of his "Rising from the Red Sands" series of compilation tapes, beginning a long running association with Gary and his Third Mind label (formerly Tone Death). In 1983, Attrition received their first exposure in the national music press through a review by Dave Henderson in his "Wild Planet" column in Sounds, which led to their "Dreamsleep" track appearing on Henderson's compilation "The Elephant Table Album", the band's first vinyl appearance. A postal collaboration with Seattle-based improvisational collective Audio Leter led to the "Action and Reaction" cassette release for Adventures in Reality. Attrition's first London concert followed, with a support slot for Coil. Martin currenty teaches music at Tile Hill college in coventry. Droney experimental/industrial sounding in their adventurous 1st LP ! It appears that this can be purchased on iTunes now.